On September 13rd of 2019, a traditional Chinese holiday called The Mid-Autumn Festival is celebrated. For the entire Chinese nation, it is a time to gaze at the moon and enjoy delicious moon cakes! 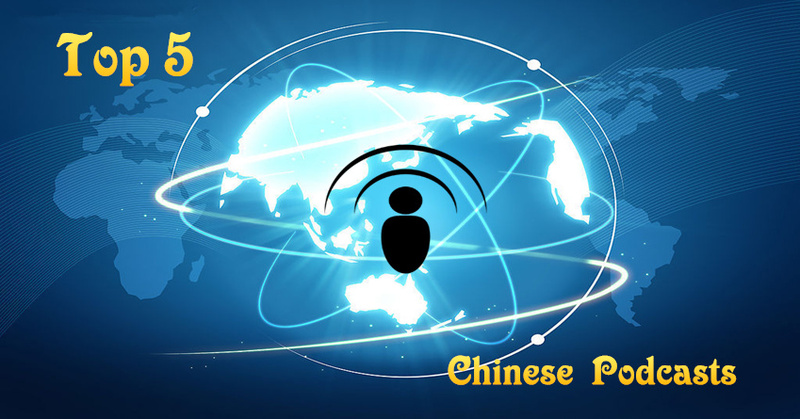 For those studying Mandarin, it is also a great time to learn more about Chinese customs. I have always been excited by how tight and sophisticated the ties between Chinese culture and Chinese language are! 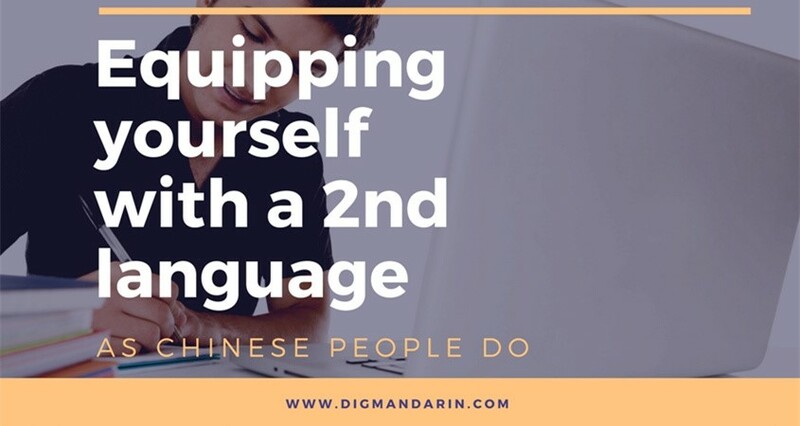 Origins of both traditions and words have similar roots; thus, comprehension of Chinese customs and habits makes Mandarin language a bit easier to study. On the other hand, basic knowledge of etymology definitely helps to understand why some habits and everyday life perceptions exist. “Mid-Autumn Festival” is the straight-forward translation of the Chinese name of the festival: 中秋节. The holiday is celebrated close to the autumnal equinox, on the 15th day of the eighth month in the Chinese calendar (almost in the middle of the month). Not surprisingly, the first character of its name is “中” (means “middle”). 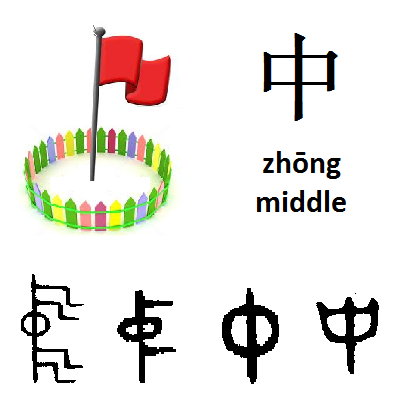 The ancient written form of 中 is in the shape of a flagpole in the center of a circle. In the fall, the Ancient Chinese would burn the fields so that they could kill the locust eggs. This prevented swarms of locust from eating the next year’s crops. 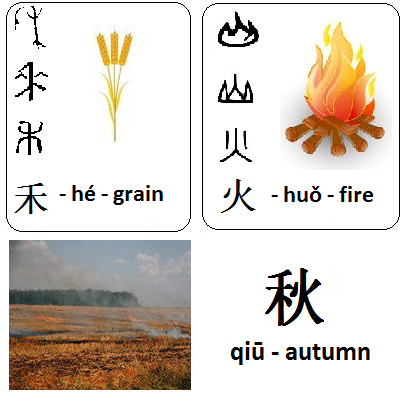 So fall 秋 consists of grain 禾 and fire 火. It is logical, isn’t it? The ancient written form of this character is like a crescent. Later, the character stands for a time unit of 30 days and thus there are 12 months in a year. 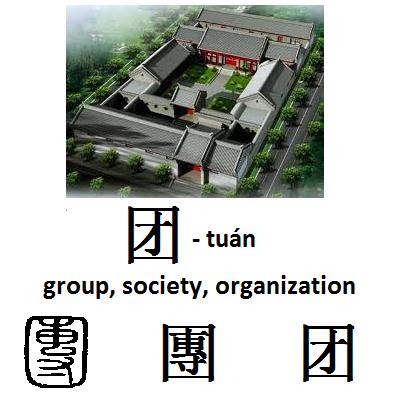 The full moon is traditionally a symbol for family reunion家团圆 (jiā tuán yuán). This concept is still crucial for Chinese people. Celebrating Mid-Autumn Festival by coming together as families to eat, drink, and be merry is not uncommon. 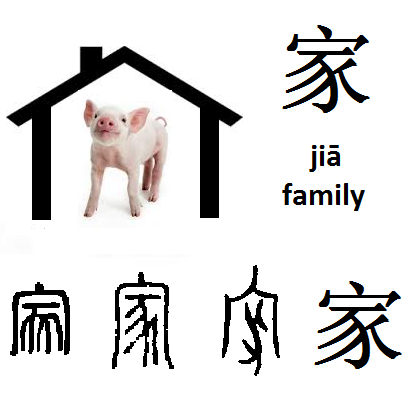 家 in 家团圆depicts a house with a pig (豕) inside. Since ancient Chinese was an agricultural society, livestock was the main property of each family, and the pig was the most common livestock. The ancient form of 团 is related to a three dimensional enclosure. 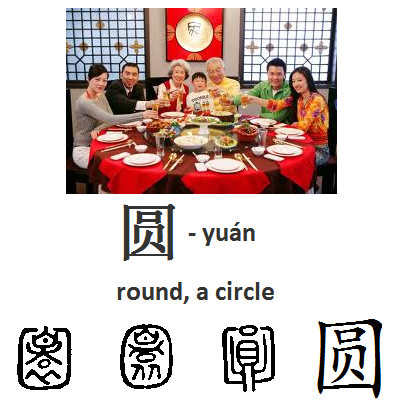 The last character for 家团圆 –圆– is the most important, since it means “circle” and derives from a pictogram of a round enclosure (or it may be a round table with food on it). 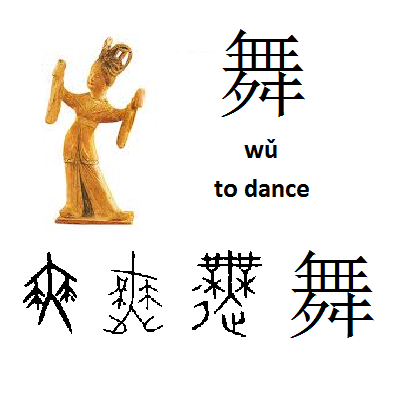 During Mid-Autumn Festival celebrations, Chinese people often dance. Ancient dancers commonly used hairy ornaments; thus, the ancient form of 舞 is in the shape of a dancer with hairy tails or dangling animal skins in both hands. During the Mid-Autumn Festival, people eat food that looks like the Moon. One of the most well-known is moon cake – a beautifully ornamented round-shaped pastry with fillings. 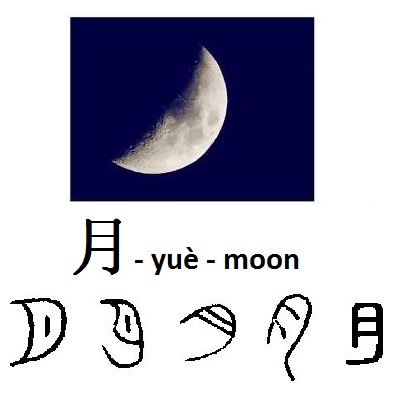 We already know the etymology of 月 (credit trisha). 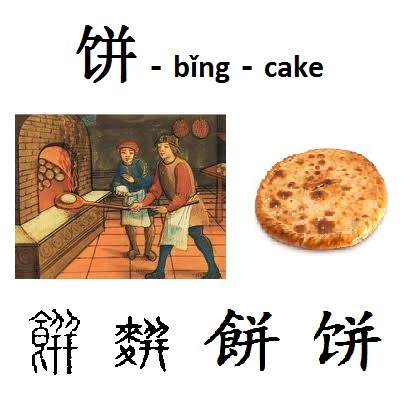 As to the character 饼, meaning “cake, pastry, something round and flat,” its origin may be linked to baking in the stove. Look how! Autumn is a time of harvest, as well, so Chinese people traditionally eat seasonal fruits during the Mid-Autumn Festival. 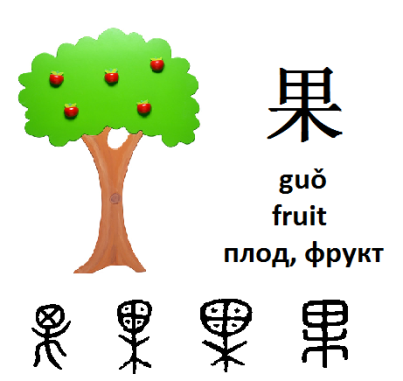 The ancient form of 果 is like fruit growing from the tree. Besides those mentioned above, there are lots of other tasty food that is traditionally served during Mid-Autumn Festival – 食品. 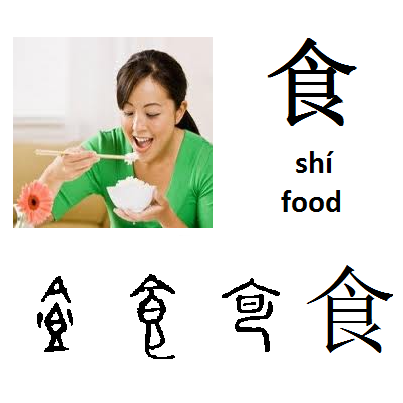 The ancient form of 食 is in the shape of a human mouth near a food container. Chinese cuisine is fantastic, so you definitely need this character in everyday life, too – not only during the Mid-Autumn Festival! The Chinese Learn Languages to Succeed. What About You? 谢谢! Thank you so much for your comment!